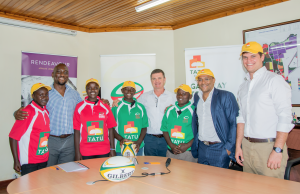 Tatu City has announced a KES 5 million sponsorship for Shamas Rugby Foundation (SRF) to set up a youth rugby clinic at Tatu Primary School, a government funded institution adjacent to Tatu City. The sponsorship is part of Tatu City’s long-term commitment to improve and develop sports in Kenya by nurturing talent at the grassroots level, through local community initiatives that improve social and economic well-being. The rugby clinic will initially target children attending Tatu Primary School, with subsequent plans to include students from four other schools in the neighbouring area. From this May, SRF will conduct three training sessions per week in the school, either during P.E. lessons or after school and will engage a team of four coaches per session training up to 120 boys and girls. In the upcoming months the clinic will include other schools in the Tatu City Area for a maximum of 5 schools. Schools in the area will get to compete against each other in inter-scholastic competitions once training has been completed. As part of the clinic, children taking part in the project will also receive life skills training. SRF founder, Azim Deen, said, “We are certain that our partnership with Tatu City will create a new pool of rugby talent which will enable Kenya to reach unprecedented success, in both the 15-a-side and sevens teams, in the coming years. We hope our program, which is primarily aimed at the informal settlements, will arm our youth with key skills and a belief that they can fulfill their dreams. “The unveiling of the partnership comes against the backdrop of Tatu City’s announcement of its support for the Kenya 15s team for a second year running, in a move that will see Tatu City become the official Test Series sponsor and Test Match sponsor for the encounter between Kenya and Germany on May 27, 2017, in Nairobi – further underpinning Tatu’s commitment to the growth and development of sports in the country.